General Motors Co. and PSA Group are discussing a valuation for GM's Opel unit of about $2 billion as the automakers push to reach an agreement as soon as the end of next week, people familiar with the matter said. The price tag would comprise about $1 billion in cash and assuming roughly $1 billion in liabilities, said the people, who asked not to be identified because the negotiations are private. The amount is still fluid as the two assess factors such as pension liabilities, the value of brand rights and savings potential, the people said. The manufacturers are working to complete the framework of a deal for PSA to buy Opel as soon as next Thursday, when the maker of Peugeot and Citroen cars reports full-year earnings, the people said, adding that an agreement could end up being delayed due to the complexities and talks could also still fall apart. A key sticking point is identifying ways to reduce costs that would earn support from unions and government, while still making the deal financially feasible given the companies' overlapping product portfolios and overcapacity in the European auto market, the people said. A critical point is how a combined PSA-Opel entity can maintain UK production capacity into the next decade, when the models built there are due to be redesigned. A combination "could release substantial synergies and improve PSA's market position in Europe where the company continuously lost market share since 2010," Falk Frey, an analyst with Moody's Investors Service, said in a report. "Diversification within Europe would increase as Opel is strong in markets where PSA is not." PSA shares erased losses to close up 0.2 percent at 18.525 euros in Paris trading on Friday, valuing the French manufacturer at 16 billion euros ($17 billion). GM rose 0.7 percent to $37.28 as of 12:13 p.m. in New York. After talks to create Europe's second-biggest automaker went public on Tuesday, initial resistance has softened as GM executives visited unions and government officials in Germany and the UK, home of Opel's sister brand Vauxhall. 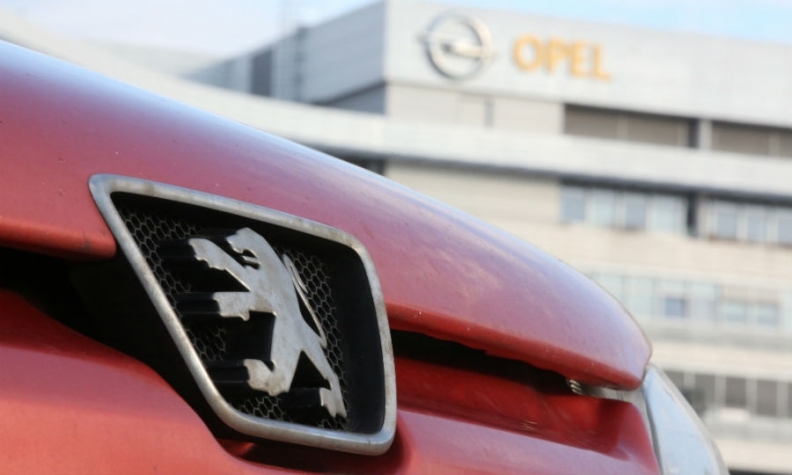 "We are prepared to conduct talks with PSA in the case of an acquisition openly and in a constructive manner and to bring those talks to a conclusion as soon as possible," Wolfgang Schaefer-Klug, Opel's top labor representative, said in a statement Friday, after a gathering of workers near the brand's German headquarters in Ruesselsheim. "Our objective must be to seize the existing opportunities to safeguard employment and sites to create a successful Opel/Vauxhall." The three main countries that would be impacted by the plan -- Germany, France and UK -- are facing political upheaval, heightening scrutiny of a deal that would affect thousands of people. PSA employs 184,000 workers, while Opel has 34,500 employees, with nearly half of them in Germany. The UK is negotiating post-Brexit economic ties with the EU, the French presidential election has been upended by a nationalist groundswell for Marine Le Pen and German Chancellor Angela Merkel's own bid for a fourth term is on the line with a resurgent Social Democratic Party. German authorities are monitoring the negotiations and will do everything they can to secure jobs at Opel, Merkel said at a press conference in Berlin. UK Business Secretary Greg Clark traveled to Paris late Thursday for meetings with French government and auto industry officials to make the case for retaining manufacturing in Britain. The carmakers have been trying to win over the constituencies, with GM CEO Mary Barra visiting Germany on Wednesday to talk with Opel management and GM President Dan Ammann meeting this week with officials in Germany and the UK. In a bid to ease potential friction, PSA CEO Carlos Tavares is open to maintaining Opel's current management structure and intends to keep the unit as a German company and brand, a person familiar with his thinking said Wednesday. Opel's workers could welcome the move to PSA, which has returned to profit after a bailout in 2014. The German company's labor leaders had actively pushed for GM to sell in 2009 before the U.S. automaker, which has owned Opel since 1929, called off a deal at the last minute. After racking up about $9 billion in losses since 2009, GM is now motivated to ready for a change. "What is pretty clear is that the negotiations with Peugeot are advanced and more concrete proposals are imminent," Len McCluskey, general secretary of Unite union that represents Vauxhall workers, told reporters Thursday after meeting with Ammann. "We're not talking about months."